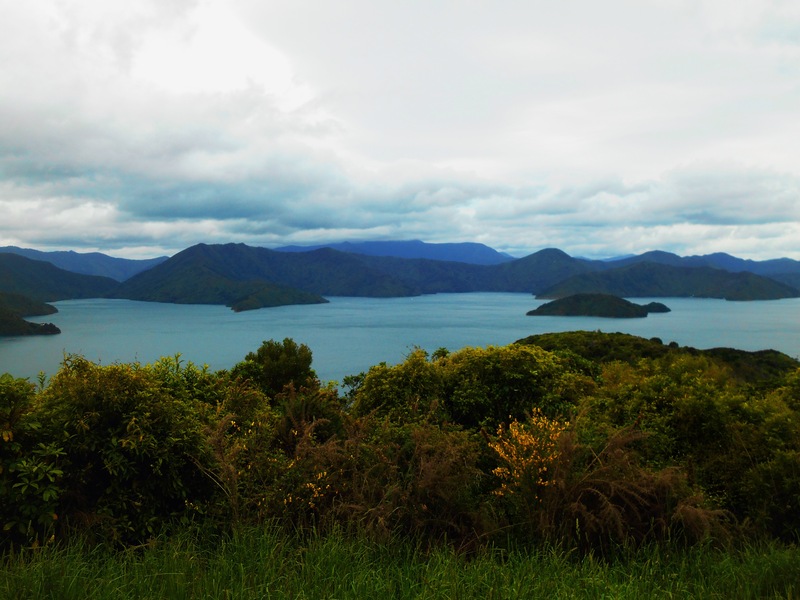 In Picton we walked along one of the finger like prongs out of the town. 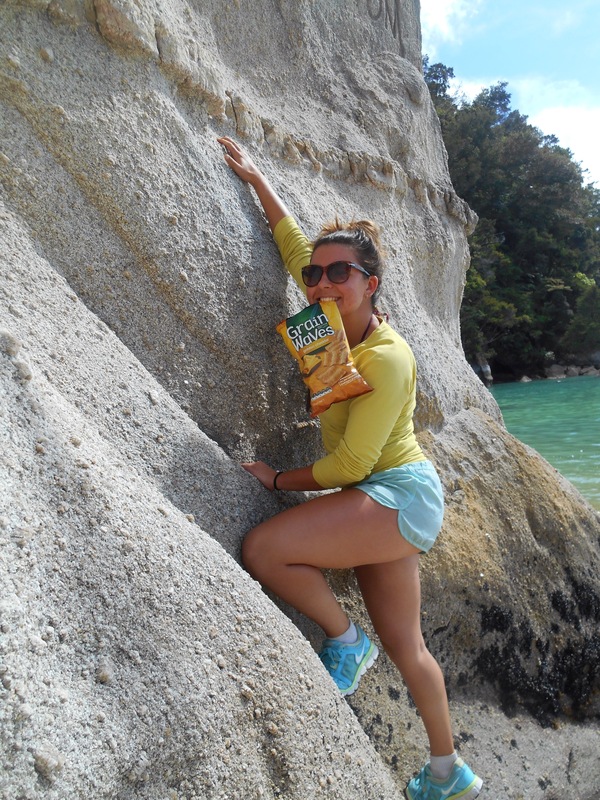 Over a few hours of forest trails with glances of gorgeous scenery to our sides, we emerged to Queen Charlottes view. 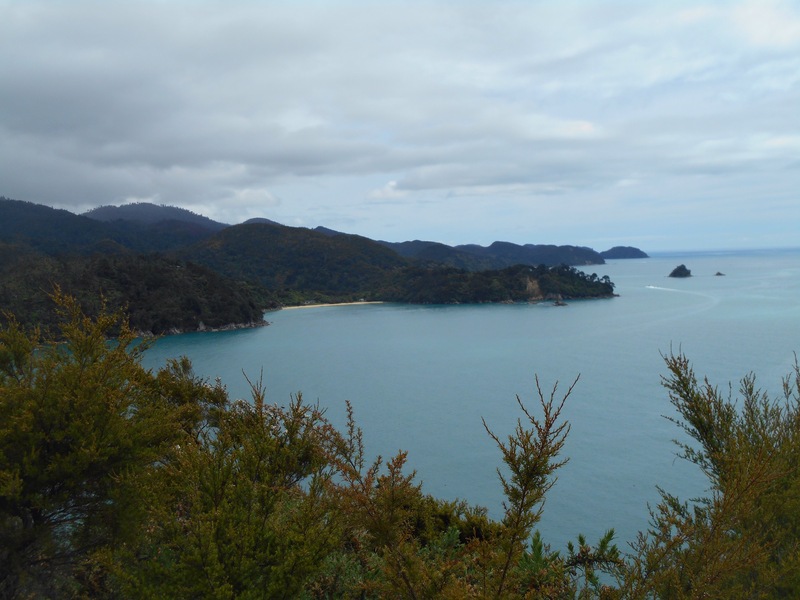 With panoramic view of other prongs and islands, you felt small perched on the top of New Zealand’s South Island. With only the morning to spare in Picton we followed the bays back to the town for our Bus to Nelson. Nelson is a little sun trap, further west on the North coast. It’s draw cards are it’s location, and the fact it is warm enough to grow hops, aka home of beer. It’s cathedral on the hill looks half religious and traditional, finished in a rush to look almost like a prison tower from the front. On the inside it’s like someone finished a 12th century building in the 60’s- on a budget. We explored the town, and the gorgeous Queens gardens, with inlets of Asian gardens, ponds of ducks and lawn, before starting the Tasman Taste trail out to Tahuna Beach. The Holiday park we stayed in was full of children and boasted go karts and Mini golf, so we took the opportunity to have our first ‘campfire’ outside our tent. It may have been over the gas canister using forks but it still counts. It took several attempts to match the biscuit with the chocolate and melt the marshmallow into something resembling a s’more. It was delicious, but really, would welcome any hints, they look so deceptively easy..? Our tarp/ doorstep looked like a chocolate crime scene when we emerged from the tent in the morning. 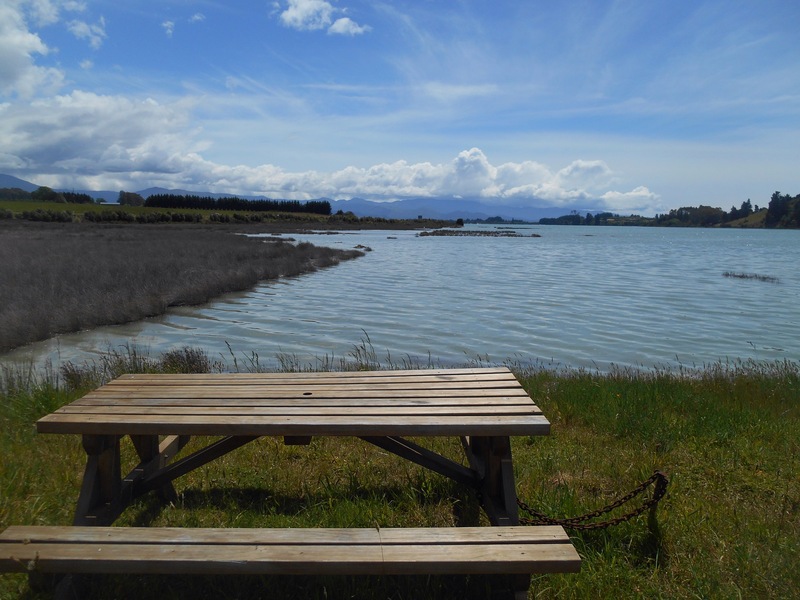 We packed up and headed along the coastal trail out to Rabbit Island, catching a little ferry across the water to Mapua. The coastline was beautiful, the hazy blue mountains stretching off into the distance and little estuaries meeting the sea all the way along. From our Mapua rest we ploughed on to stop waterside in Tasman for picnic with a view, then had a steep climb through logging country. From the top, each direction boasted amazing views of mountains in the distance, and bald looking farms in the foreground. We pushed on to Moteuka, our legs beginning to reawaken after several rest days. The other side of the town we entered Kaiteriteri mountain bike park and hurtled through sandy bends and tree roots. Emerging the other side, panniers still in tact, got talking to an English expat family, their young children showing us up in the bike park and stunt equipment. We set up for the night in Kaiteriteri and passing a burger stop we planned to get an early and lazy dinner. We have been caught out several times by eateries closing earlier than we anticipated, but were surprised that at 5:30pm, there was no food to be had on a Sunday night in Kaiteriteri, so pasta was back on the menu. Also uninvited to the party were some gusty winds. It was to be a long night of huddling. 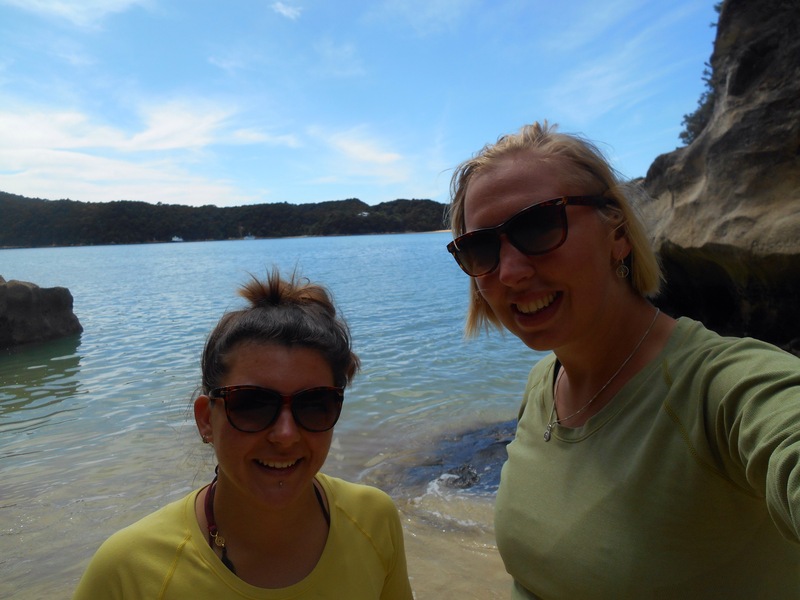 We were up bright and early for our day trip into Abel Tasman National Park. The beach looked gorgeous as we stepped onto the boat for our cruise into the park. We passed several inlets, the water glinted under the sunlight like it held a thousand diamonds. Our eyes were torn between wanting to watch the amazing scenery and being encapsulated by the activities of the English couple next to us who in a short hours journey managed to have several bursts of activity interspersed with naps. 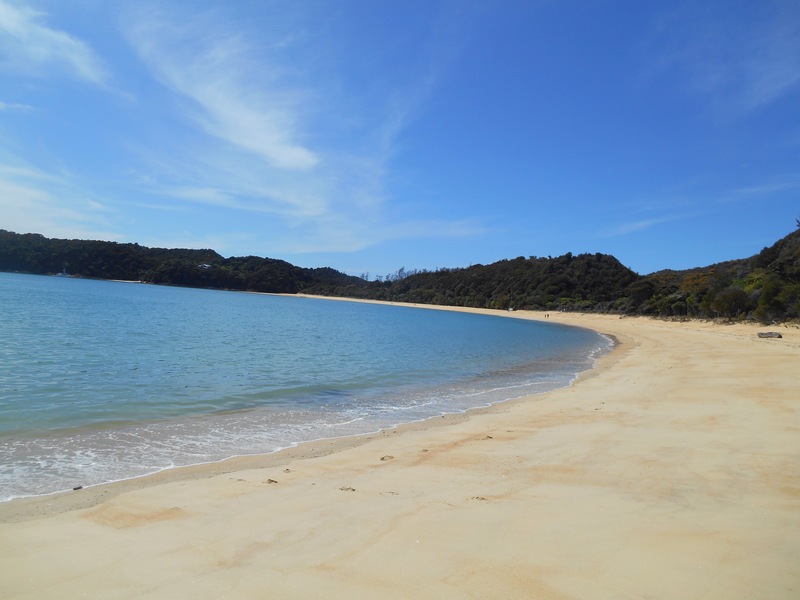 The boat dropped us at Anchorage Bay, an empty curve of golden sand. We walked to the far end to cross the lapping water and climb the rocks. After our exploring, we returned to find the seagulls had found our hastily purchased picnic and had pecked into our crisps. As we frightened them off, the waves splashed what remained of them. We buried them all to punish the birds with sandy beaks and headed off back down the beach. We took ourselves up to a beautiful lookout point where to each horizon was calm waters in every shade of blue. Realising we hadn’t started our 4 hour journey and had actually moved further from the start, we began to regain ground along the beach and follow the path which climbed up into the scrub for more amazing views. The walk was 12km, following a shadowy little path, trickling waterfalls to one side, blues and beaches to the other, underfoot the crunch of leaves and roots, the occasional foot bridge, and lots of other walkers passing by with their large packs. Dressed in our usual attire of short shorts and tank tops, we definitely felt underdressed next to those in unnecessary thermals and gaiters. There was some funny looking birds we saw in several places, all with adorable fluffy young. The parents looked like they were wearing a fascinator on their heads, or like a cartoon where a donkey has a carrot dangled in front of his head to make him run. We stopped at a little beach inlet for lunch. Other hastily selected items included rice crackers, cookies and fruit with a side order of the tide coming in and soaking our trainers. We walked at quite a pace and you could feel aches in quite different places to on the bike, tiring but in a different way. 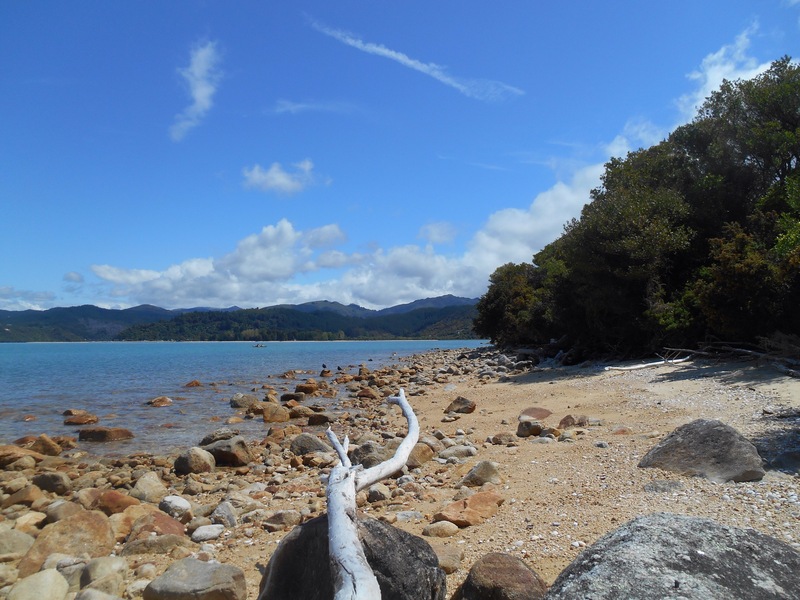 From the end of the trail, Marahau, we bused back to Kaiteriteri where our constant struggle with the restaurants continued. This time it was 4:30 and still all the restaurants had closed. 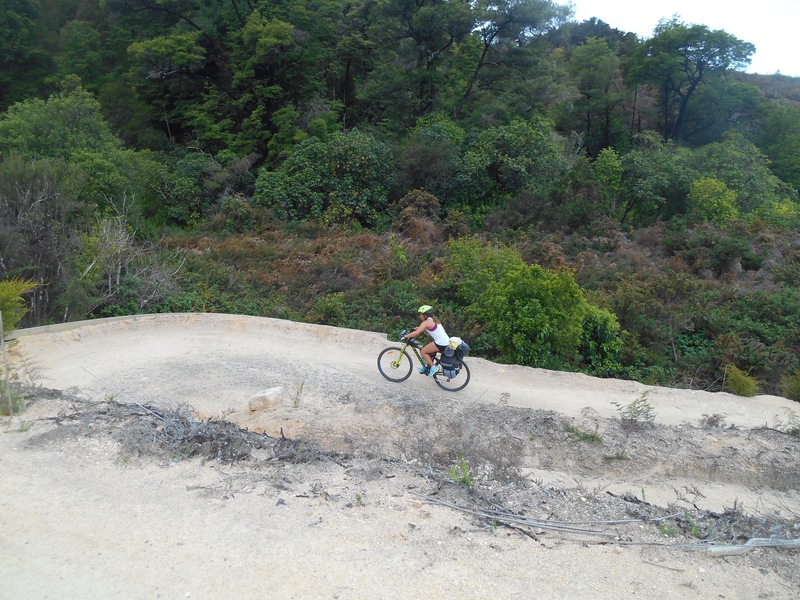 I proceeded to wear myself out in the mountain bike park whilst still luggage free, like a bounding puppy who needs an extra walk, and managed to clock up a good two hours of quad pumping trails, maybe around 20km, before we set off from Kaiteriteri. It was a 15km ride to Motueka where we stocked up on several meals fearing we may not see a supermarket for a few days. We had brownie followed by lunch in the sun and then left Motueka for Motueka Valley Highway. The South Island looks very hilly, but so far the roads have been kind to us and the road wound between the mountains, goats, sheep, horses, alpacas and birds appearing roadside. You can only write “it was a very nice view” in so many different ways, but really, each corner unfolded new produce growing, animals grazing and the steep definitions of each grassy knoll. The headwind was strong, to the point you were having to peddle to go downhill. Mid afternoon my motivations were waining and we stopped for a rest when a man peddled past. He had no top, no helmet and was wearing sandals and shorter shorts than us. When he realised we were touring too, and English, he stopped to chat to us and spent nearly an hour with us there roadside showing us all of his journeys marked on a map. He had been biking around for 2 years and had clocked up several kms, but found the idea of paying for camping abhorrent so had all the gear, 4 water bottles, to ensure he could survive and wash in the streams. After the rest my motivations into the wind diminished further and I was flagging, unsure we would ever reach Tapawera. Another thing we have noticed about New Zealand is that the road signs disagree often and whilst you can pass one marker saying 10km to Tapawera, you can peddle on only to find the next one says 12km. Approaching a hill, the gusts got more forceful and I experienced genuine anger with the wind. It was such a relief to get to our stop that we planned to treat ourselves to a nice cream and a pint. On entering the pub, both ideas went out of the window, as did those planned dinners we had so carefully selected and carried, and we bought burgers, nachos, milkshakes and cake. Yikes not liking the sound of those winds. Give me rain anyday.